In recent years Andrei Monastyrski has received international recognition for his work with Collective Actions, a group of artists who have organized actions in the fields around Moscow since 1976. Though his poetry is less well known, that is where it all began. 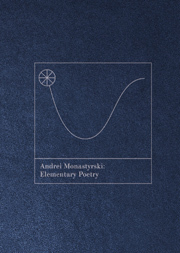 After writing poetry in the manner of Russian modernists, newly available to Soviet readers during Khrushchev’s thaw, Monastyrski’s interest in John Cage and ideas about consciousness from Western and Eastern philosophical traditions led him to deepen his dialogue with poetry of the past through experiments with sound, form, and the creation of artistic environments involving carefully conceived objects and situations. Elementary Poetry collects poems, books, and action objects from the ’70s, tracing a genealogy of the art action in poetry. With a preface and afterwords by Brian Droitcour and Yelena Kalinsky. ANDREI MONASTYRSKI (b. 1949) is a poet, author, artist, art theorist based in Moscow. He is, along with Ilya Kabakov, one of the founders of conceptualism in Russia. He graduated from Moscow State University with a degree in philology and worked for many years at the Literature Museum in Moscow. In 1973, he began to work with serial structures and minimalist sound compositions and in 1975, turned his attention to poetic objects and actions. He is best known as a founding member and chief theoretician of the Collective Actions group, which began to stage outdoor actions on the edges of Moscow in 1976. He compiled many of the group’s documentary volumes, Trips Out of the City, and participated in many solo and group exhibitions with his own work. In 2003, Monastyrski was awarded the Andrei Bely Prize in literature. He also received the Soratnik Prize in 2008 and the Innovation Prize in 2009. His poetry and theoretical writings have been gathered into several Russian-language volumes by the publisher German Titov for his Library of Moscow Conceptualism series. BRIAN DROITCOUR is a writer, translator, and curator, as well as a doctoral candidate in Comparative Literature at New York University. From 2002 to 2007 he lived in Moscow, where he covered exhibitions for The Moscow Times, contributed to the Russian art monthly Artchronika and edited their English digest editions, and translated books for WAM Knigi, an art publisher. He has contributed essays and reviews to Artforum, Art in America, Rhizome, The New Inquiry, and other publications. In 2012 he won second prize in the Compass poetry translation competition for his rendering of Marina Tsvetaeva’s 1921 long poem, Upon a Red Steed. YELENA KALINSKY is an art historian based in Lansing, MI. She earned her Ph.D. in Art History in 2013 from Rutgers, the State University of New Jersey with a dissertation entitled Collective Actions: Moscow Conceptualism, Performance, and the Archive, 1976-1989. In 2012, she edited and translated Collective Actions: Audience Recollections from the First Five Years, 1976-1981 (Soberscove). Previously, she worked as an archivist and Dodge curatorial fellow at the Zimmerli Art Museum, where she curated the exhibition Performing the Archive: Collective Actions in the 1970s & 1980s. Her writing has appeared in ARTMargins, Russian Literature, Nova Galerija Newspapers, and elsewhere.